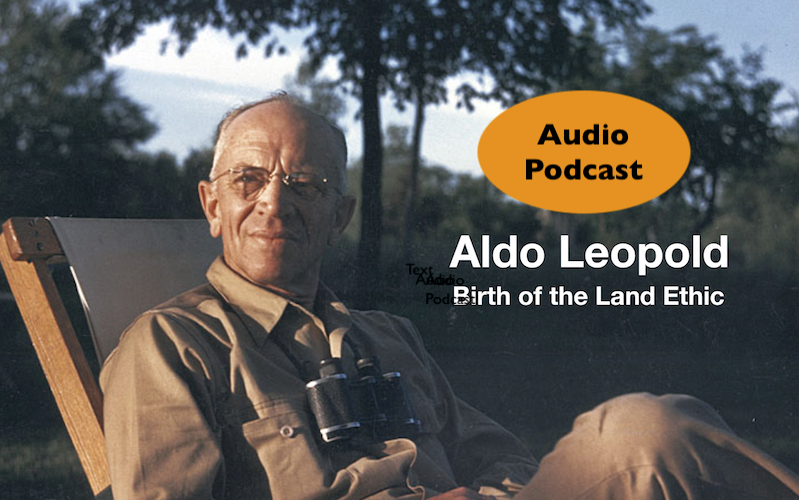 Aldo Leopold was one of the most talented and important contributors to America’s conservation movement. In the 1920s, he successfully lobbied for the creation of the first wilderness area in the world. In the 1930s, he established the field of game management by championing the idea that lands could be managed for the benefit of both the people and the wildlife that lived on it. Also in the 1930s, he was the first to engage in habitat restoration. His experimental work at the University of Wisconsin’s arboretum was the world’s first prairie restoration project. He and his family also began a restoration project on their own farm, a property they had purchased with the intention of reestablishing forest and prairie. His lifelong work resulted in the posthumous publication of a collection of Aldo Leopold’s essays, entitled A Sand County Almanac. The book became an enormously influential part of America’s conservation history and ethos. Over 2 million copies have been sold and it has been translated into more than one dozen languages. One of the important insights Leopold gave us was that rather than seeing land as a thing to be exploited, that we could view it as a community to which we belong. That, in fact, if we saw the world through this point of view, it would benefit humans and wildlife alike. Intrigued by Leopold’s story, I traveled to Wisconsin to interview Leopold biographer Curt Meine, Leopold historian Stan Temple and the Executive Director of the Aldo Leopold Foundation, Buddy Huffaker.